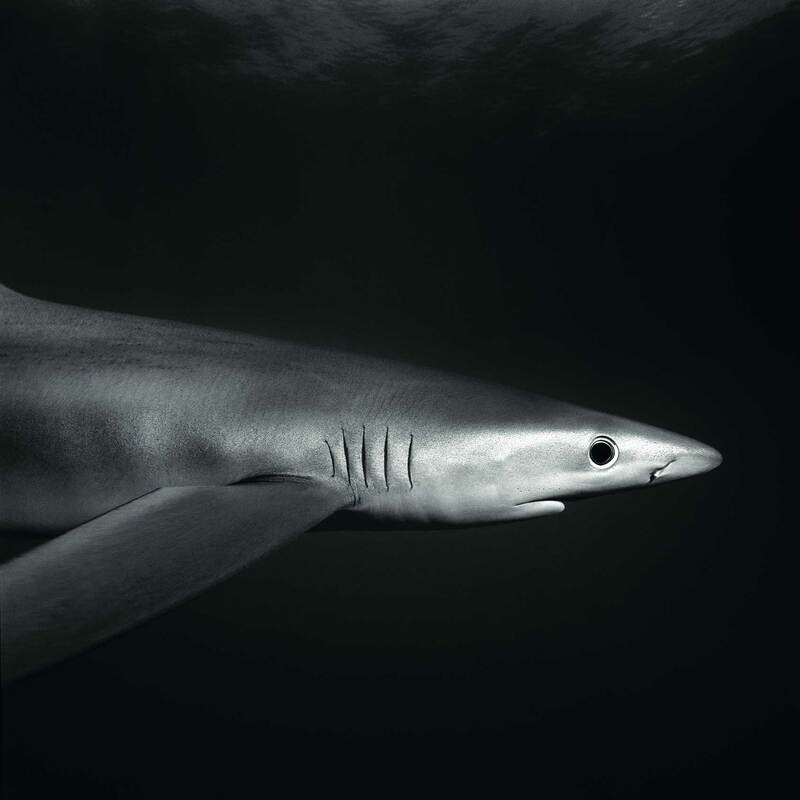 Editor’s note: Observed every year on June 8, World Oceans Day seeks to honour, help protect, and remind us all of the exceptional need to conserve the world’s oceans. A day that us, as a bunch of sea-loving Aussies in the T+T office, can most certainly get behind. And a day that we thought perfect to revisit these 12 pictures and their stories that were graciously shared with us from the pages of Blancpain’s Edition Fifty Fathoms by its editor, Dietmar Fuchs. Each year as part of the Blancpain Ocean Commitment project, 12 of the world’s best underwater photos are showcased in the annual publication. And these are some of the best since printing began in 2008. Oh, and in case you missed it, there’s a new Ocean Commitment watch to admire too. Around 2008, underwater pictures of marlin were in big demand as it was extremely difficult and dangerous to get shots with the ultimate fast fish. 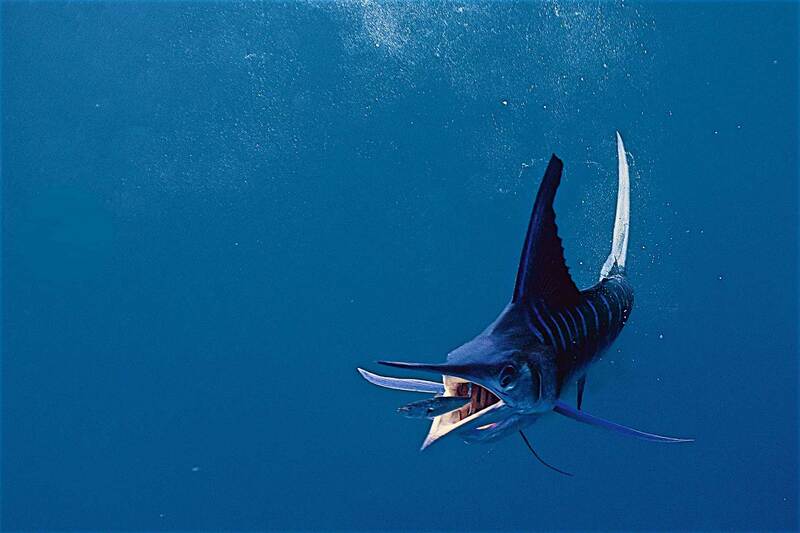 If a marlin were to attack, no diver could escape. I was in the middle of the ocean when I saw the marlin hunting, but much too far away, so when some panicking sardines started heading my way I prepared for a fast shot. And then it happened — the dark blue shape of a marlin swimming in my direction, as I focused on the sardine closest to me. When I could actually see the shape of a big fish in my viewfinder, I pressed the shutter. I had no idea that I took the picture in the perfect moment — for me at least, not for the sardine. I have to admit that the diver and the humpback whale became my iconic shot. In the beginning I didn’t really want this to happen, as Hawaiian authorities don’t want to promote swimmers and, even worse, divers trying to swim or dive with whales. As it happened, we’d just climbed back on board after a dive when a humpback whale seemed to fall in love with the boat, so we slipped into the water again — no tank, just cameras, and the whale started to play with us. 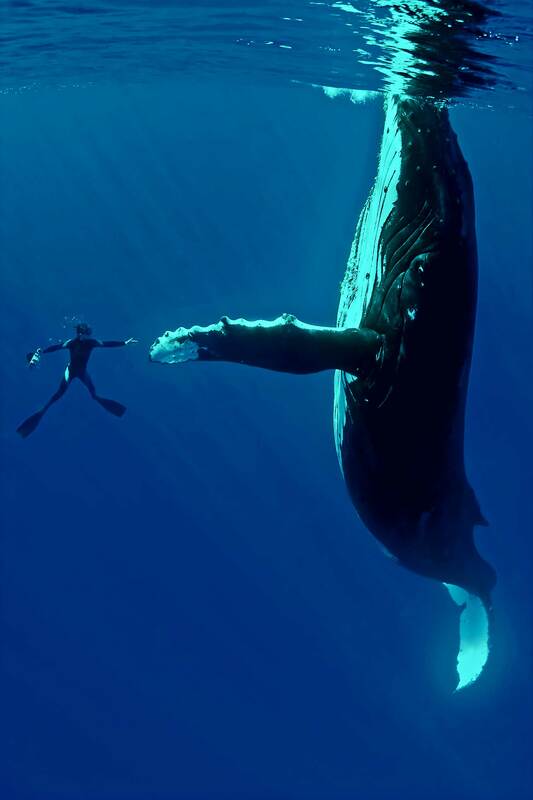 He touched us with his fin and didn’t want to let us go — and there was no rule that forbade whales playing around with divers. When we finally climbed back into our boat, the whale kept following us around until he eventually found something more interesting. I was so lucky to get these pictures, and to have them so widely appreciated. ‘Reaching out’ has also become an iconic picture for Blancpain’s Ocean Commitment. 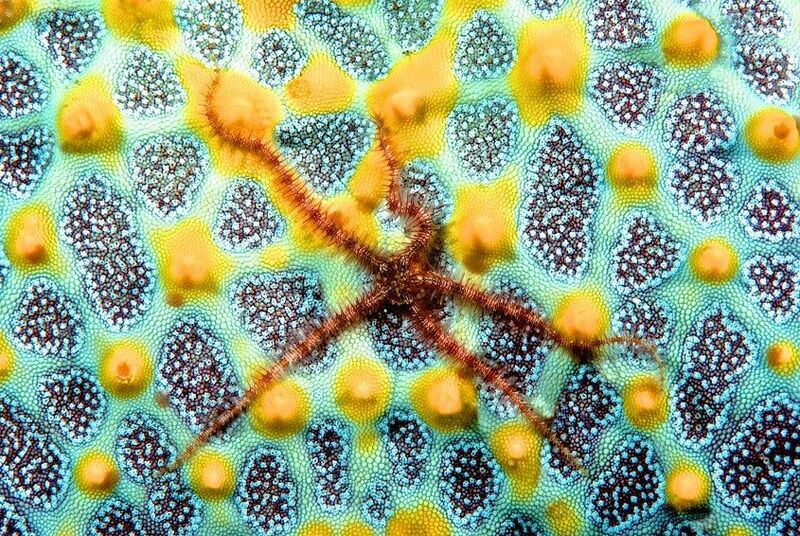 I took this shot while I was on a Socorro trip on the Nautilus Explorer. All the divers were disappointed because of bad weather and high waves, but one day the sky was clear and the sea calm. 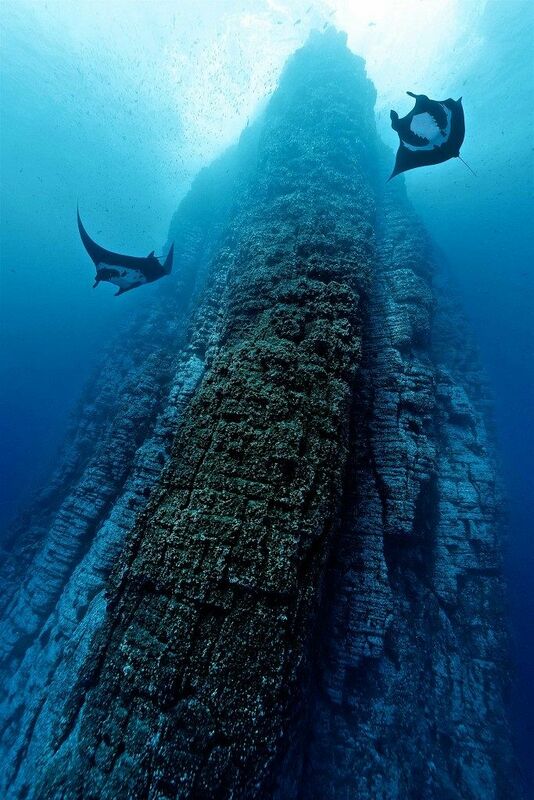 Far from any coast we reached Roca Partida (Parted Rock), a volcanic vent that isn’t much to look at from the surface, but underwater it’s the most impressive scenery I’ve ever seen, with sharks, mantas and humpbacks. While trying to capture the most spectacular part of the erecting rock with a fisheye lens, I was surprised by two mantas coming around the corner. I had one shot only, and then they were gone. With post production, I removed the unattractive lens distortion, and intensified contrast and sharpening. 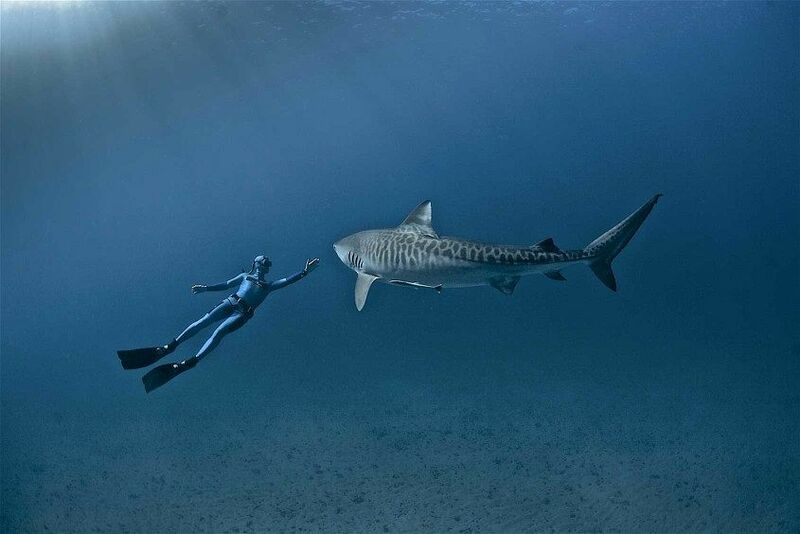 On this trip, we spent 10 days interacting for hours with large tiger sharks escorted by dozens of black tip sharks. It was perfect, except for the visibility, but I was still waiting for the shot of the trip — the shot you want to happen but don’t know exactly what it’ll be. A few days before leaving, a storm struck and we got stuck on land for three days. Then on the last day of the trip, the ocean miraculously calmed down and the visibility cleared up to a stunning 40m. We’d already spent five hours in the water, with up to eight tiger sharks simultaneously, including this particular large and peaceful female. At some point my colleague William stabilised himself mid-water, and as the shark approached he extended his arm. She slowed down and looked at him for a while: a true interaction where both protagonists wanted to meet. Rajan is a bull elephant, born in India around 1950, and later brought to the remote Andaman Islands to haul timber. 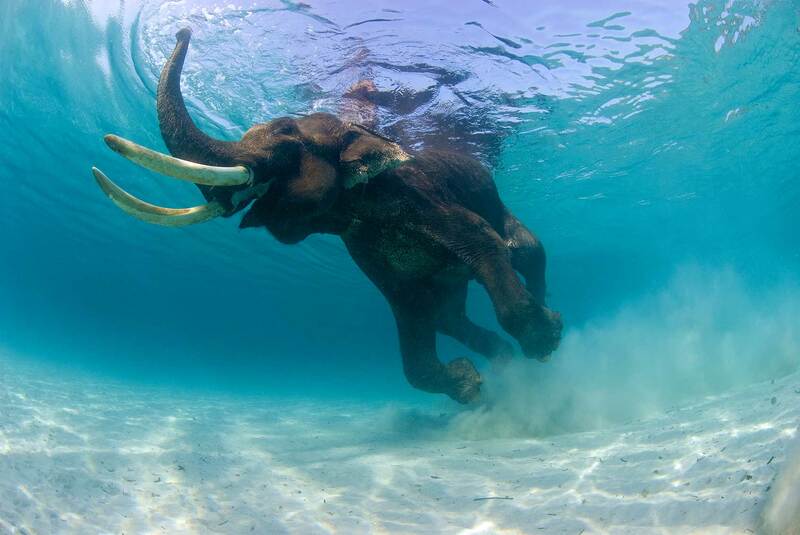 There he met a female elephant, an avid swimmer with whom he often enjoyed refreshing dips after work. The pair lived happily together for decades, until a few years ago the female succumbed to a cobra bite. Inconsolable, Rajan became deeply depressed and disinclined towards work, and therefore useless to his employers. Fortunately, about this time a movie director heard about his swimming abilities and cast him in a major motion picture. He was then moved to Havelock, an idyllic, mostly undeveloped island, where he gradually regained his spirit. After filming was completed, Rajan settled into a relaxed life, spending much of his time wandering the forest with his handler. He still enjoys occasional swims, entertaining beachgoers and a few lucky photographers each year. Everybody has heard about the Bikini Atoll in the Pacific Ocean, where the USA detonated atomic bombs in the 1940s and ’50s. You cannot dive there and not think about how radioactive it must still be. So, with my imaginary geiger counter ticking away, I dove into the unbelievable big wreck cemetery the Americans left on the sea floor. As unbelievable as it seems, nature has claimed the territory back, leaving no reminder of the destructive nuclear force unleashed there. The wrecks even seem to have much more coral growth than normal. I still remember my thoughts when I took the picture of one of the giant hawseholes of the aircraft carrier Saratoga. The anchor pocket came alive and the coral branches were climbing out of it and trying to entangle me and my camera. Nothing, it seems, can destroy nature — not even an atomic bomb. It’s time that we learn to honour nature and not to destroy it. Formally known as the Hauraki, this ship was seconded by the Japanese and used as a transporter during WWII. Due to her history, this was a special dive for me. I love wrecks and it was on my photographic list. With a depth of 50m, a lot of preparation went into this dive, and once inside the wreck, we had to be careful not to disturb the sediment. The stern of the vessel holds some really interesting cargo like bulldozers, tractors, diggers and lorries, all in relatively good condition. 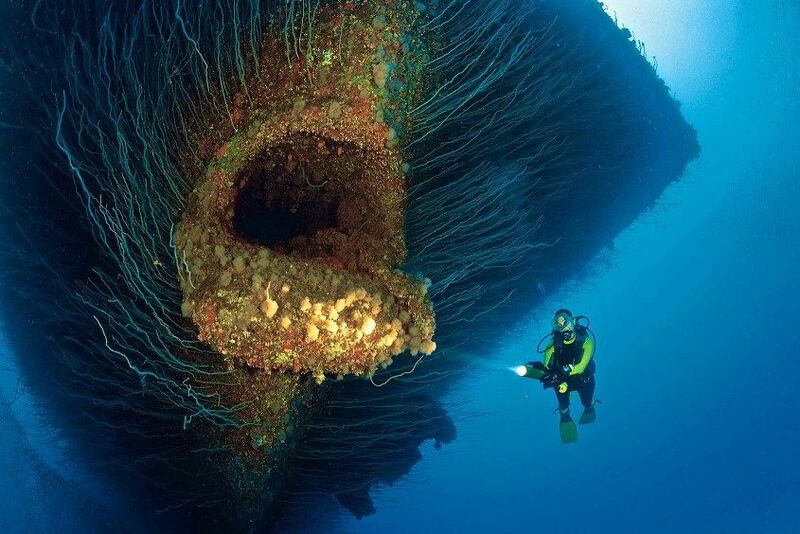 The wreck provides an amazing dive and photographic experience. 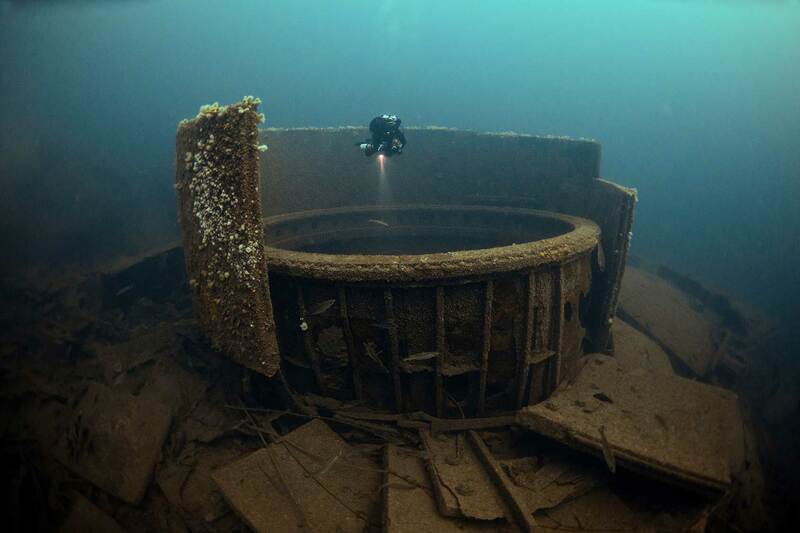 This image is the giant “barbette” or turret armour that once housed the forward guns of HMS Audacious, the first British battleship to be sunk in the First World War. This was a “super dreadnought”, a ship as mighty as the name sounds, and at the time of its sinking it was among the most powerful warships the world had ever seen. 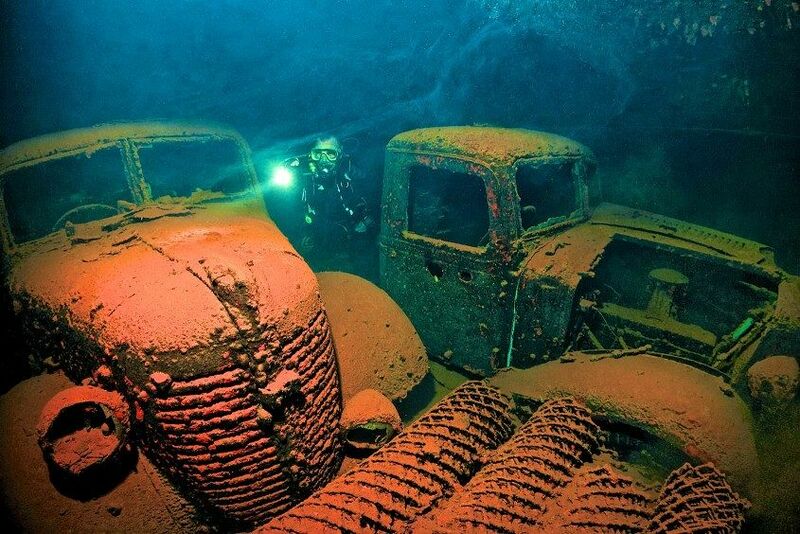 However, sites as spectacular as this cannot be found easily and this wreck lies in 65m of cold North Atlantic water off the coast of Ireland. At this depth we have to breathe exotic gas mixes containing helium, and our ascents require long decompression stops. We spotted this huge piece of wreckage soon after our descent, and as I swam to find the best angle, my dive partner instinctively dropped into the centre. I knew immediately this was the image that could show the true spectacle of this incredible wreck. I spent an entire grey, chilly day watching for grizzly bears in Patterson Deep Bay, Alaska. I was scanning the shore with my binoculars when whitish smudges on the water’s surface drew my attention to the ocean. First, I took the discolouration for floating garbage, but my sadness in the face of increasing environmental pollution soon turned into fascination and joy when I recognised the strange phenomenon for what it truly was – a rare invasion of moon jellies. I’ve never been faster in jumping into my dry suit and readying my underwater camera. The sight from below was even more spectacular – a giant wall of moon jellies, reaching from a depth of 35m up to one metre below the water surface, where the fresh water from the river created a natural barrier for the fragile creatures. 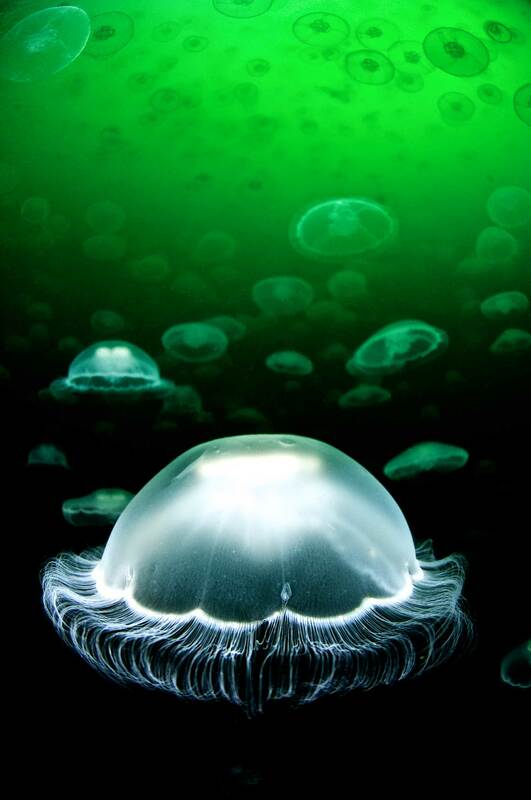 Our bubbles opened small passageways in the cloud of pulsating umbrella-like bodies, presenting us with a surreal, supernal experience: hovering in the slight drift among billions of dazzlingly beautiful moon jellies. To go where nobody has been before is a dream for a lot of people. This is especially true when you discover something new in an underwater twilight world – where less than one per cent of the sun’s rays reach. Looking for the extremely rare coelacanth in his own deep environment was just my kind of thing. We had been looking for days deep down, where every five minutes of dive time would mean about an hour of decompression, drifting aimlessly through the Indian Ocean with no chance to surface until the decompression time was done. 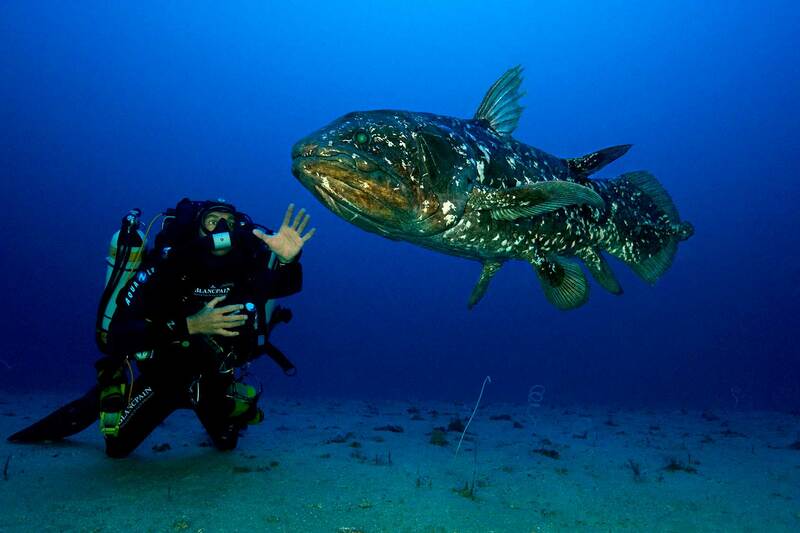 So each minute we spend with the coelacanth was an incredible adventure for us — even better than anticipated. This is one of my favourite shots as it shows us — the fish and the diver — deep down in the middle of nowhere. The light is very weak but it’s still efficient, proof that this deep ecosystem is not the absolute darkness we imagine. I hope people looking at this shot get a sense of how it felt to be alone with a creature that hasn’t changed for the last 65 million years.